Root canal treatment is the removal of the tooth's pulp, a small, thread-like tissue in the center of the tooth. Once the damaged, diseased or dead pulp is removed, the remaining space is cleaned, shaped and filled. This procedure seals off the root canal. Years ago, teeth with diseased or injured pulps were removed. Today, root canal treatment saves many teeth that would otherwise be lost. Once the pulp is infected or dead, if left untreated, pus can build up at the root tip in the jawbone, forming an abscess. 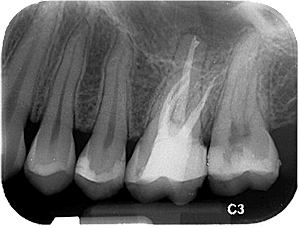 An abscess can destroy the bone surrounding the tooth and cause pain. First, an opening is made through the back of a front tooth or the crown of a molar or pre-molar. re cleaned, enlarged and shaped in preparation for being filled.